Find hotel near Iglesia De La Inmaculada ..
A beautiful church located just minutes away from Hotel Del Prado. The church is dedicated to dogma of the Immaculate Conception by Mary, freeing her from all sins. It was constructed in late 40’s and was inaugurated by Bishop Carlos Valiente and has since then become one of the favourite places of worship for the local catholics. The beautiful image of Mary on the stained glass is a must watch. 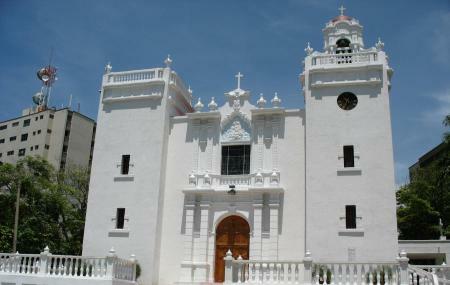 How popular is Iglesia De La Inmaculada Concepcion? People normally club together Catedral Metropolitana Maria Reina and Sala Del Carnaval Elsa Caridi while planning their visit to Iglesia De La Inmaculada Concepcion. Beautiful church with beautiful stained glass windows. Located in the traditional barrio Prado (Prado neighborhood). Very charming Catholic Church ! Beautiful house of God !! !